The connective tissue uniting all these episodes is that Obama pinpointed the core philosophical issue dividing the two parties in American life today, and framed the distinction in unusually stark terms. Republicans consider the distribution of wealth produced by the market economy to be sacrosanct, or at least quite fair. (“Social Darwinism” does not describe a belief that poor people should be killed but that the free market is a perfect mechanism for rewarding merit.) Democrats consider that distribution to be shot through with unfairness. From these differing assumptions, the two parties proceed to their radically divergent approaches to the redistribution of income. 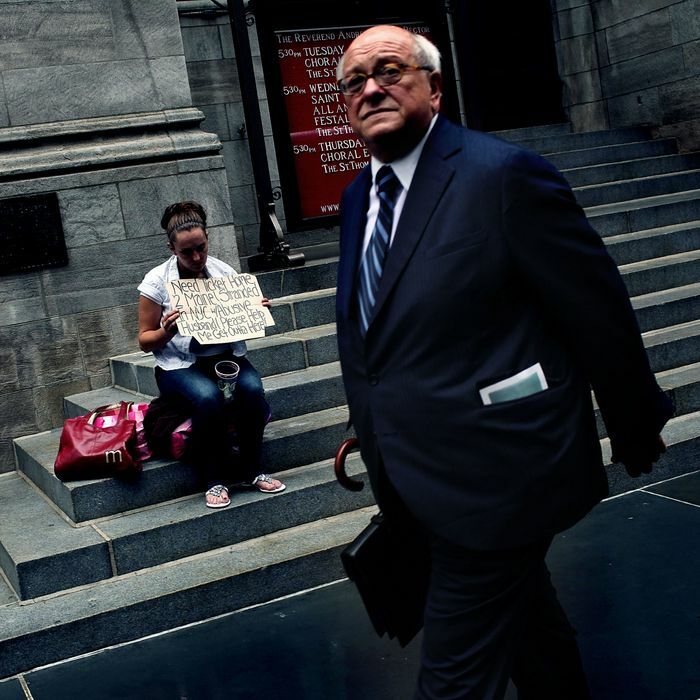 The degree to which one presumes people deserve to keep their market income is a question of values. But it is also connected to questions of fact. Conservatives and liberals build their differing beliefs about the sanctity of market income in part on empirical observations about the importance of hard work and skill versus luck. And a large and growing body of literature shows that this question can be resolved in liberals’ favor. It’s almost impossible to argue that American success is not earned. We can all think of times when our hard work has gotten us ahead or when we’ve been punished at work or in life for making poor decisions. Even if America’s not perfectly meritocratic, we all see how hard work pays off. It’s the exact opposite of everything I learned growing up in Wisconsin, or at college in Ohio. When I was waiting tables, washing dishes, or mowing lawns for money, I never thought of myself as stuck in some station in life. I was on my own path, my own journey, an American journey where I could think for myself, decide for myself, define happiness for myself. That’s what we do in this country. Note that both Ryan and Brooks (his close adviser) argue on the basis of intuition. Obama is wrong, they say, because they see it with their own lives and have personally experienced the impact of talent and hard work on success. Empirical study tells us otherwise. Susan Dynarski, a professor of economics, education, and public policy at the University of Michigan, writes up a new study in today’s New York Times showing the interplay of talent and economic advantage. The study compares students at four different quartiles of math ability in their sophomore year of high school and tracks them according to their family’s socioeconomic status. Math ability certainly plays an important role in success. At every income level, higher-scoring students are more likely to complete college than lower-scoring students. Chart via New York Times. But family income matters more than math talent. Among the poorest students, the two highest-scoring groups stand just a 23 percent and 41 percent chance of graduating college. 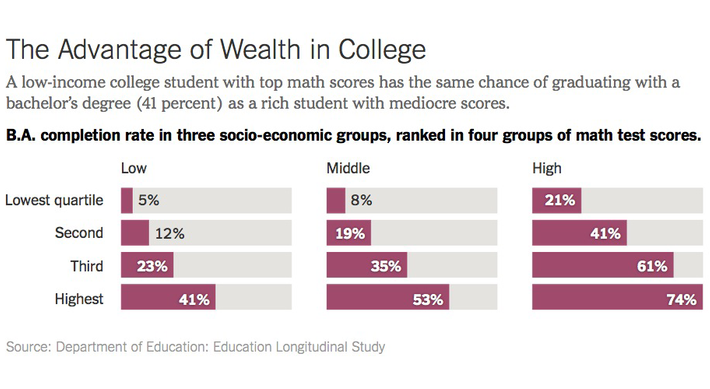 That is about equal to the two lowest-scoring groups among the richer children. That is to say, poor children must show unusually high proficiency at math by their sophomore year just to have the same chance to graduate college as the academically mediocre children of rich families. That finding is best understood in conjunction with another study of academic attainment and family wealth, by the Pew Charitable trusts in 2012. That study compared the incomes of children born into different income quintiles, from highest to lowest, and distinguishing between college graduates and non-college graduates. 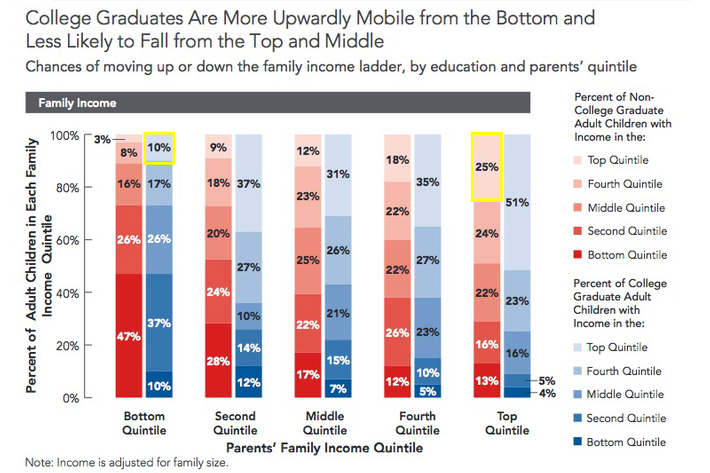 Dynarski’s study, above, shows that poor children who manage to graduate from college have beaten the odds. They require, on average, more academic ability in order to obtain a college degree than a more affluent child. Through some combination of talent and hard work, in addition to luck, they have overperformed. A child from an affluent background who fails to graduate college has also beaten the odds, in a negative way. Through some lack of hard work or talent or, of course, luck, they underperformed. And yet a child from a poor background who beats the odds to graduate from college is still less likely to wind up in the top fifth of income earners than a child from an affluent background who failed to graduate from college. The number highlighted in the upper left is the proportion of children who grew up in the lowest-quintile, graduated from college, and earn in the highest quintile: just 10 percent. The number highlighted on the right is the proportion of children who grew up in the highest quintile, failed to obtain a college degree, and wound up earning in the highest quintile anyway: 25 percent. None of this is to say that inherent ability or hard-work have no bearing — they data suggest they do. Nor is this to say that we should stop advising people to try their hardest and do everything within their power to advance themselves — of course we should (and Obama does so regularly). But the conservative belief that our income mostly reflects merit is not only a philosophy to which they’re entitled to subscribe, it is also the simple denial of reality.